La-La Land Records and New Line Cinema present the world premiere release of renowned composer Shirley Walker's (BATMAN: THE ANIMATED SERIES, THE FLASH, TURBULENCE) original motion picture score to the 2003 New Line Cinema feature film WILLARD, starring Crispin Glover, R. Lee Ermey, Laura Elena Harring and Kimberly Patton, and directed by Glen Morgan. 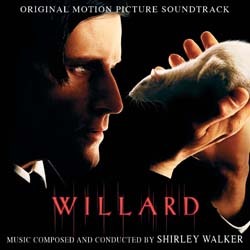 This brilliant and haunting orchestral horror score is one of Walker's finest, incorporating a unique, almost Herrmannesque use of accordions. Thematically rich, Walker's spellbinding music is as thoughtfully heartbreaking as it is atmospheric. Produced by Neil S. Bulk and mastered by James Nelson, this special release of 3000 units features in-depth liner notes by writer John Takis that include comments from the director and others. Note: the song "Ben" as performed by Crispin Glover was not available to license for this release. I can only say this one thing... FINALLY! Sorry for the late entry... I am just thrilled, thrilled! Sadly the song "Ben" was not here, but the score... well why are you still here! Go Get This! I'm assuming that was a dream sequence or is an even stranger movie than I thought. Shirley Walker had done two of my favorite shows.